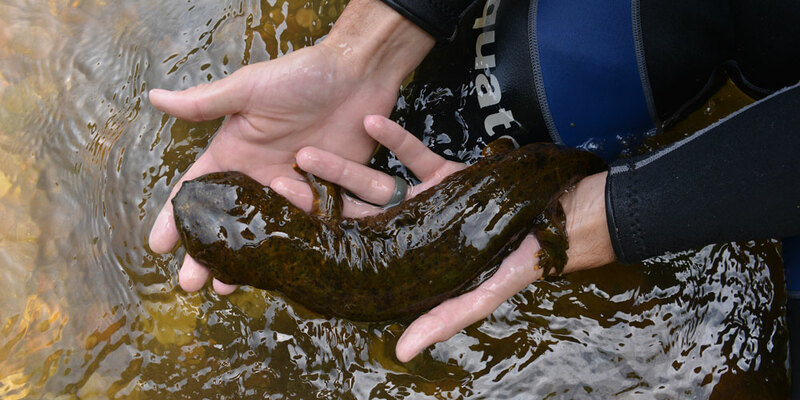 They’re called a lot of uncharitable names — snot otters, devil dogs, hellbenders — but the ancient aquatic creatures of Appalachia are a prime indicator of the health of our waterways. Ancient creatures of the underworld have been lurking just beyond Jon and Brittany Laing’s cabin all week. In the dark hours of night, while they were sleeping. 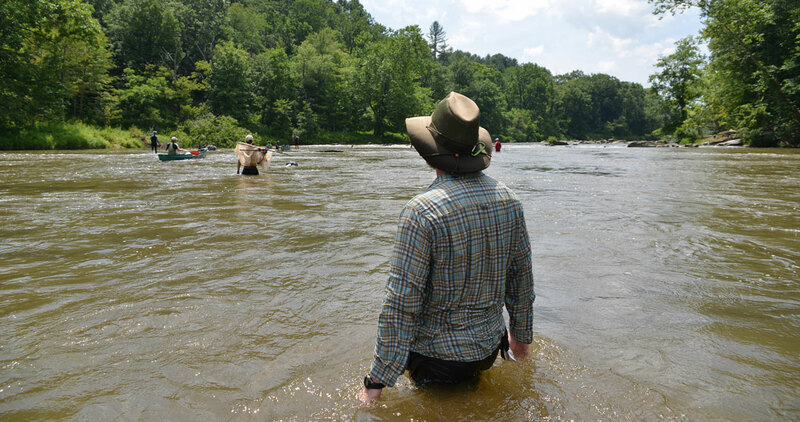 In the high heat of afternoon, while they lazed on the banks of the New River in Ashe County. But the Laings didn’t know what lived in the water until their site was invaded by dragon hunters. The Laings stand next to their fold-out chairs, watching, amazed, as Ed and his crew unload nets and stores of equipment from truck beds. The gear includes peaveys — logging hooks repurposed to lift rocks — with handles labeled: Snot Otter Survey. 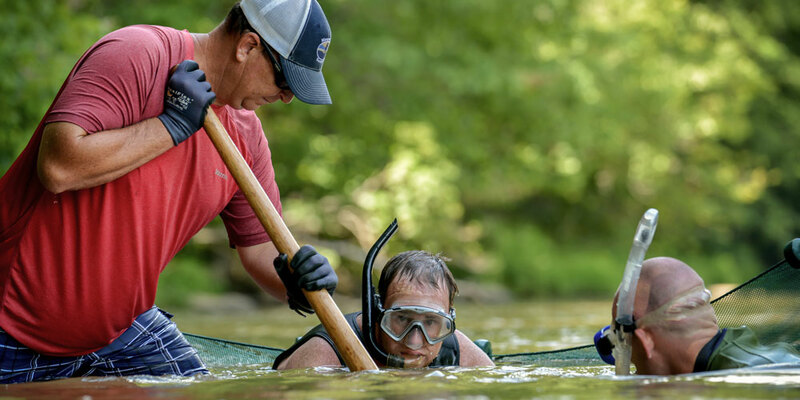 Over the years, Ed has learned that the survey works best when volunteers are separated into four groups: Lifters pull rocks from the river-bed, divers snorkel under them to look around, and seine net holders attempt to catch whatever escapes. Animal processors inspect any salamanders found and record data in a support boat. The Laings descend the river access steps to watch the team work. “This has got to be the coolest crew around. Check out the wet suits,” Jon says, eyeing the outfits that help state agents and citizen-scientists brave water temperatures that can cause hypothermia, even in summer. The snorkelers fan out, and the hunt begins. The hellbender is part of a family that includes the largest aquatic salamanders on earth, and its ancestral range stretches from New York to Mississippi. In North Carolina, they can be found in five river basins: the New, Watauga, French Broad, Little Tennessee, and Hiwassee. There’s a subspecies of Ozark hellbender in Missouri and Arkansas, which is so threatened that it’s now an endangered species. The New River is thought to be the second-oldest river in the world, and it has long been a haven for hellbenders. The species has persisted, mostly unchanged, since the age of dinosaurs. The recent decline in their population is due, in part, to sedimentation, which suffocates their eggs and blocks entry to their hideaways under rocks. There’s also concern about pollutants, human predators — including fishermen who mistakenly believe that hellbenders negatively affect trout populations — and the habitat disruption that occurs when people move river rocks. In the past two decades, this species, long either maligned or little-known outside of scientific circles, has finally been attracting admirers. “They’re getting attention because there are people who’ve spoken out on behalf of this species for years,” says Joshua McIntyre, a New River State Park ranger. 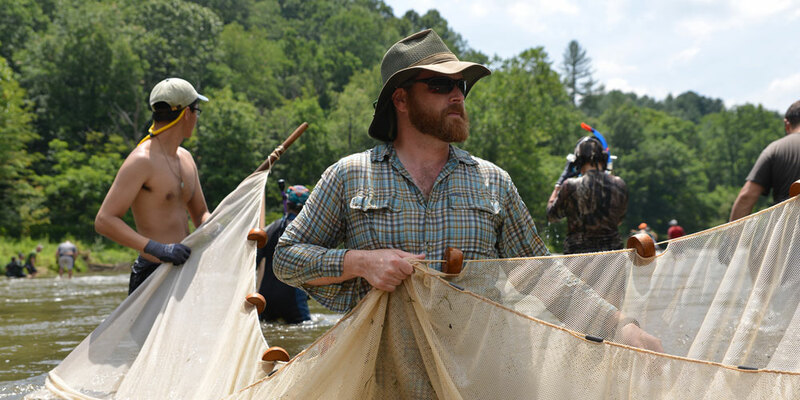 Now, they’re celebrated at the Watauga Riverkeeper Festival in Valle Crucis. Pisgah Brewing Company in Black Mountain and Nantahala Brewing Company in Bryson City both have beers named after hellbenders. And, for the first time, New River State Park’s visitors center is selling bumper stickers to people who want to promote the species. In a nod to the hellbender’s nocturnal tendencies, the stickers even glow in the dark. 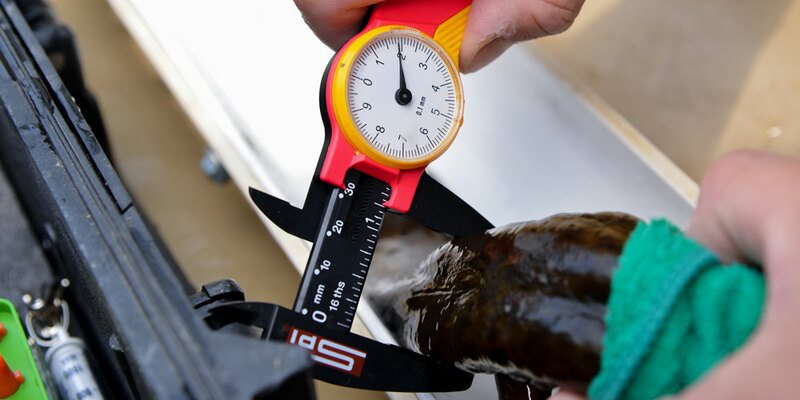 Historically, perceptions of the hellbender have been rooted in fear. Unfortunately, even with the movement that’s reshaping the species’ popularity, this has been slow to change. Joshua has heard it said that the salamander got its name because it was “born in hell and it’s bent on getting back there.” Subsequent lore indicates that seeing a hellbender is a harbinger of bad luck. But those who understand ecology know that finding a hellbender is actually one of the luckiest things that can happen in certain waterways. The hellbender brings messages from the underworld — that is, from the depths of the sweet soil and earth-pumped water that sustain life. Its presence is a sign of an entire ecosystem’s health. But to heed the wisdom it has to share, humans have to be paying attention. Appalachia could be called the Serengeti of salamanders, with more genetic diversity than anywhere else on earth, and in its vast collection, the hellbender reigns supreme. (North Carolina has 65 species, with 50 found in the mountains alone.) This camouflaged species can grow up to two feet in the wild, yet a ranger working on the New River can go years before catching a glimpse of one. Anytime someone boats or swims in the river, they’re — often unknowingly — communing with ancients. The Laings steady themselves by holding the edge of a canoe while burly men lift rocks with their logging tools and divers disappear under the water to search for hellbenders. Brittany claps when someone across the river finally shouts: “Got one!” Another volunteer likens the captured hellbender to a “ridiculously cute” miniature dinosaur, and Brittany agrees. Its beady eyes meet hers, and she declares herself a new fan. “We need hellbender T-shirts!” she says. After the animal is weighed, it’s placed in a measuring trough made from PVC pipe. Maria Palamar, a veterinarian and a deputy director of the NC Wildlife Resources Commission, runs an electronic device across the salamander’s body, searching for a previous survey tag, but nothing turns up. A found tag would indicate survival rates, but it’s nonetheless a joyful moment. Maria notes the salamander’s scar tissue for the record. When his information has been recorded, she holds a wet washcloth over his eyes to calm him and slips a tracking device, small as a grain of rice, under his skin. This is one bad boy she hopes to see again. Across the river, divers are making discoveries. There’s another hellbender. Then another! And another! Every animal found is a tangible message of hope, a celebration of nature’s tenacity. When hellbenders are present, it means trout and other aquatic creatures are thriving. With each new find, the crew erupts into whoops and hollers. Divers ferry salamanders across the river in white mesh bags. Henion is a writer and photographer based in western North Carolina. Her essays and articles have appeared in Washington Post Magazine, Smithsonian, Oxford American, Orion, Preservation, and a variety of other publications. She has garnered a number of accolades for her work, including a Lowell Thomas Award, and her stories have been noted in three editions of The Best American Travel Writing. Her debut book – Phenomenal – was published by Penguin Press in March 2015.